We’d love your help. 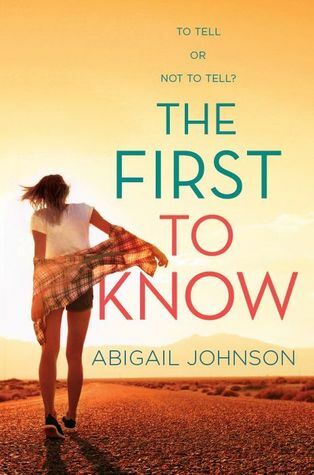 Let us know what’s wrong with this preview of The First to Know by Abigail Johnson. Dana Fields's father never knew his parents. When Dana secretly does a DNA test for her dad, hoping to find him some distant relatives for his birthday, her entire world implodes. Instead of a few third cousins, Dana discovers a half brother her age whose very existence means her parents' happy marriage is a lie. Dana's desire to know her half brother, Brandon, and the ext Dana Fields's father never knew his parents. When Dana secretly does a DNA test for her dad, hoping to find him some distant relatives for his birthday, her entire world implodes. Instead of a few third cousins, Dana discovers a half brother her age whose very existence means her parents' happy marriage is a lie. To ask other readers questions about The First to Know, please sign up. Now this book had the good kind of drama I enjoy in my stories! Rashika recommended this book to me and because I was feeling like a good YA contemporary, I decided to give it a shot. I have to say, it was a solid recommendation from her because I wound up liking this story! What I liked the best about The First to Know was how it handled a very delicate and serious topic but the story as a whole managed to be hopeful in tone. I don't think I would have liked the story as much if I had not liked the main character, Dana, as much. I'm usually not fond of characters that keep life-changing secrets, but Abigail Johnson made me care for Dana and she made me understand where the teen was coming from. Dana had good intentions and all she wanted was to do something she thought would be nice for her dad. She didn't expect her whole life to be unpended. I liked that when she found out about the existence of her step-brother that she took steps to make him feel welcomed and loved. I feel like not everyone would react in such an open-hearted way. I liked the romance here too. It wasn't too in your face, which I appreciated. The romance between Chase and Dana was really lovely. Dana found comfort with Chase and together they made for a sweet couple. I enjoyed watching their bond develop over the course of the book. I also enjoyed all the complicated elements. When Dana found out about her step-brother, she was obviously very much shaken, and we see how that affects all her relationships. I would have liked a bit more closure towards the end and I did wish I had liked Dana's sister a little bit better, but those were my only real complaints about this book. When Dana wants to surprise her father, who grew up in foster care, by finding his biological relatives through DNA testing, she never expected to find Brandon, her same age half-brother. Brandon wants nothing to do with Dana or her sister or their father. And Dana’s mother has no idea. She doesn’t want to break up their family by revealing the truth. Abigail Johnson’s sophomore effort is filled with drama and heart. Dana’s a beautifully flawed character. Crushed under her softball coach dad’s tough expectations, feeling second best to her sister Dana truly wants to get he father an epic birthday person, biological family. Her methods aren’t always wise or honest, but she genuinely wants to make everything right for everyone. Once again I am left utterly speechless by an Abigail Johnson novel. How does she do it!?!! Because The First To Know is the most incredible, agonising, rip-your-heart-out-and-then-sew-it-back-together, amazing book. Asdffdhngikaldnvj....I hope the publisher wasn't expecting a put-together, coherent review, because all they are going to get is swooning, sighs, exclamation marks and fan-girling. Because it really is just. that. good. When Dana decides to surprise her father with a birthday present Once again I am left utterly speechless by an Abigail Johnson novel. How does she do it!?!! Because The First To Know is the most incredible, agonising, rip-your-heart-out-and-then-sew-it-back-together, amazing book. Asdffdhngikaldnvj....I hope the publisher wasn't expecting a put-together, coherent review, because all they are going to get is swooning, sighs, exclamation marks and fan-girling. Because it really is just. that. good. When Dana decides to surprise her father with a birthday present to beat all birthday presents, she could never have expected the bombshell she would unleash. The DNA testing kit was supposed to unveil some long-lost family members - parents or cousins perhaps - for her father who grew up in foster care never knowing anything about his heritage or family. Instead, Dana discovers that her father has a son. A son who is not that much older than she is...and not that much younger than her sister. Confused and devastated, Dana keeps her secret while desperately trying to learn more about her brother, even if it means getting close to Chase, her brother's cousin, a guy who is starting to mean so much to her, a guy she really shouldn't be lying to. This book put me through the emotional wringer. It tore my heart out. I was literally reading some of it peeking through my fingers. I knew that the big unveiling of the truth was going to come, you know from the summary that this secret is going to blow up, big time, but it was still agonising to watch. The part about the DNA testing tearing Dana's family apart didn't really hit me until I got a good look at her family. And while things aren't perfect, while Dana might have problems with her relationship with her Dad, there is no doubting the close bond between her parents, between their whole family. It's really sweet but also sad knowing where the book is going. And then there is the romance.... I don't know what to say, I really don't. Except maybe, amazing and incredible and breathtaking and....aghhh! There are so many layers to this book. While Dana is wrestling with her family secret she is also trying to lead her softball team to state championships, balance the love she has for her sister with the resentment she feels about their respective talents and choices in life, and also navigate the unrequited feelings of one of her best friends. So the themes of sport, family, friendship, and romance all give so much depth to this book. The time Dana spends with Chase is everything she needs and everything she knows she can't have while she is hiding the truth from him. He is so up-front, honest even when he is hurting, and sure about what he wants. Determined, hurting, kind, sweet (and did I mention incredibly attractive). I was a little unsure about the ending as I was nearing the final pages. Surely I wasn't going to be left with a broken (read: wrecked, totally devastated, I-need-ice-cream) heart? But Abigail Johnson not only delivers an emotionally overwhelming book, but one that is also hopeful, loving, forgiving and (sorry, if this is getting repetitive, but) totally AMAZING!! In case my review is not already clear, I absolutely loved this book. I can't wait to shove it into the hands of my readers, can't wait to share the reactions and love that this book will inspire. I highly, highly recommend this book for readers who enjoy realistic fiction, contemporary novels that seamlessly combine romance, friendship, relationship breakdown and the importance of family in one incredible book. This is a new author for me so I didn't really know what to expect. I just thought upon reading the synopsis that the plot is interesting. A story of a young girl who's trying to prove herself to her father, that pushes her to plan this ridiculous gift for his birthday. And that gift results to whole new problems Dana and her family have to face. Expectedly, there's so much drama in this story that I really welcomed with open heart. Usually there are parts in dr This is a new author for me so I didn't really know what to expect. I just thought upon reading the synopsis that the plot is interesting. Usually there are parts in drama or realistic fiction that can be boring and slow especially in novels that I just skimmed over them, But the author didn't give me a chance to do that. Every scene I devour because I got invested in the story and especially to the characters. I fell in love and care for them , especially Dana, because of everything that's going around. This is a story of a family who learned how to accept themselves and forgive. Be warned, this book will wreck your emotions yet will leave you hopeful and contented. Oh did I really almost forgot about Chase. Yeah the romance... :) :) It was sweet and unique in it's own way. I was even surprised I'd like the romance in the book. Maybe because, I wasn't expect there would be a definite romance in the story but again the author didn't disappoint. Such a lovely book, I’ll keep an eye on this author as so far I’ve been enjoying her stories. Abigail Johnson is a new-to-me author so I had no idea what to expect but The First to Know blew me away. It’s a heartfelt family drama and totally worth it. Dana Fields just wants to do something nice for her dad for his birthday. What starts off as a heartwarming gesture soon turns into Dana’s worst nightmare. In her search for her father’s family, Dana discovers that she has a half-brother her age that no one knew about. When she confronts her half-brother, he wants nothing to do with her. Abigail Johnson is a new-to-me author so I had no idea what to expect but The First to Know blew me away. It’s a heartfelt family drama and totally worth it. I know, I know. This all sounds like a soap opera and it kind of is but in the best way possible. Johnson clearly knows how to write her dramas. The book is just dramatic enough, the angst just right enough that it doesn’t become overbearing. Instead, you feel sympathetic to Dana’s dilemma who really doesn’t know what to do with this new found information that has the possibility to tear apart her nearly perfect family. Watching the tension build up and Dana struggle to figure out what to do is truly satisfying in some ways because nothing about the situation is easy. There is no simple answer and there is no right or wrong. Johnson forces readers to step outside of our occasional black and white binaries to truly examine the complexity of the situation at hand. I loved every single minute of it. Of course, like all books, this one isn’t perfect either but it IS good and one I’d recommend to anyone who loves some substantial angst and good drama. The First to Know is absolutely worth the read and I do hope you’ll choose to give it a shot! This was one of my Can't-Wait Wednesday picks, so I had pretty high hopes for this book. I am happy to report it did not disappoint me. What would you do if you were the first to know something that could destroy your family? This is the question Dana struggled with in this book, and I couldn't stop flipping the pages as I watched Dana build her house of cards. •Pro: Many different types of families are explored. Single mom, single dad, foster kid, large family, extended families, adopted families. Families come in all shapes and sizes, and it's nice to see them represented. •Pro: Dana! This young woman was put in a tough position, and she had to hold so much inside as she tried to make the right decision. I couldn't imagine having that sort of information, and knowing it could destroy my life as I know it. She didn't always make good decisions in this book, and her decisions often had major repercussions, but they all came with good intentions, and she learned a lot of herself, her family, and she was better for it. •Pro: This books is packed with great characters. I found them all to be well developed and they made significant contributions to the story. I also cared about them. •Pro: Speaking of caring, I found myself quite emotionally invested in this family. The joy, the loss, the pain, the betrayal -- it was all there. •Pro: There were a lot of side plots, and when I stood back and took in the big picture, I was able to see how they were all part of the big picture. •Con: The ending, though good, left me glad about some things, a little sad about others, and with a bunch of questions about yet more things. •Pro: The drama was delicious! I kept sneaking little pieces of this book, because I had to know what happened next. It was quite addictive. •Pro: There is a lot of love and grace shown and there were a few times I thought my heart would burst. •Pro: I loved Dana's romance. Her romantic interest won me over with the first overture he made towards Dana, which was far from your typical romantic gesture. •Pro: This book blended stories of families, friendships, relationships, and romance, and it did it well. Overall: A heartfelt story of family secrets, filled with great characters and lots of feels. I received an electronic copy of this title from NetGalley in exchange for my honest review. To be honest I was on the fence about this one going into it. On the one hand, I absolutely devoured and loved Abigail Johnson's first book, If I Fix You. However I also was skeptical about the plot of this one based on the summary. It just seemed like it was going to be a bunch of forced and eye-roll worthy drama. And I will admit that it took a bit to get into this one. But right around 20% in I ended u I received an electronic copy of this title from NetGalley in exchange for my honest review. To be honest I was on the fence about this one going into it. On the one hand, I absolutely devoured and loved Abigail Johnson's first book, If I Fix You. However I also was skeptical about the plot of this one based on the summary. It just seemed like it was going to be a bunch of forced and eye-roll worthy drama. And I will admit that it took a bit to get into this one. But right around 20% in I ended up hooked. It was just as dramatic as I thought it was going to be, but I devoured for exactly that reason. The MC, Dana, is definitely flawed. She absolutely recognizes her flaws though and doesn't pretend to be a perfect person. So I didn't mind her bad traits because let's be honest, none of us are perfect. She ends up in a very tricky situation and I felt so bad for her because it wasn't her fault at all. And in the middle of that mess she stumbles upon something great in Chase, but can't fully commit to it without it getting ugly. And she's in the middle of becoming an adult, so she's earning how her behavior towards others really affects people and is trying to change. And on top of all that she has got some enormous pressure from her dad and sister to be this amazing softball star. I so enjoyed all of these complicated aspects of her life and character. Chase was hands down my favorite character, and every time he and Dana were together I straight up turned into the heart-eyed emoji. That romance was fun to read about, but it was also nice that it was not the focus of the book. Dana's struggles and her family unit are really what this book is about. I would like Abigail to write all the things. Talk about feels. She knows how to write families! This was a fairly good/ interesting book. It wasn't my favorite, just because of how cliche it was, but I really enjoyed the story and how it unfolded. The main character, Dana, spends the whole book hiding a secret from her family, which makes the book very suspenseful because you never know who's going to find out/ when. I like how the author kept the reader guessing up until the last page. Overall, it was a pretty good book. Another great YA Contemporary to add to my "Read" list. Abigail Johnson is becoming one of my favorite contemporary authors! I can't wait to read more from her! Human biology really interests me. I love learning about DNA, genetics and how people are the way they are. I also adore reading about family ties in contemporary novels. So, imagine my excitement when I found out that they were all meshed together in this book! The First to Know definitely met my expectations for a good read. In spite of a few problems I had with it such as its whiny protagonist, I really enjoyed all of its other elements and I can see myself recommending it to other readers. For Human biology really interests me. I love learning about DNA, genetics and how people are the way they are. I also adore reading about family ties in contemporary novels. So, imagine my excitement when I found out that they were all meshed together in this book! For a brief summary, this novel follows teenage protagonist Dana. For a nice birthday surprise, Dana decides to run a DNA test for her dad so he could find his unknown parents or other relatives. However, she finds a half-brother, Brandon, instead and is left flabbergasted. She would like to get to know him, but does not want to lose her dad's trust. So, she decides to meet and make an effort with his cousin Chase, and get to know her half-brother through him. Soon enough, she and Chase are falling for each other. Can Dana keep this a secret without destroying her dad's trust? As I touched on, Dana was not the most agreeable character. Her stubbornness and constant complaints turned me off, and for the most part I couldn't stand her. Fortunately, all of the other aspects of this book were strong enough to overweigh this, so it is easy for me to shift my focus off of Dana and onto the positives about this wonderful story. In light of the positives, the plot was quite unique and captivating. Although it didn't have the most realistic storyline in that I don't think it would be as easy for Dana to get in touch with her stepbrother in real life, it was for sure riveting enough to be relatable and enjoyable. I thought that the romance with Dana and Chase, though unlikely, was adorable as well! To sum everything up, The First to Know was an interesting story. The storyline had me enthralled and the writing style was up to par, however the unlikable character of Dana is what bothered me the most. If you are into heartwarming and captivating stories centring around family ties and cute romance, then be sure to give this book a try! This was depressing and predictable. Dana was a selfish, annoying little brat and the rest of her family wasn’t much better...neither was her best friend or that weird, mute guy Nick. Chase was ok, I guess, but I really didn’t care about any of those characters. tl;dr review: This concept excited me so much and it was executed so well. The romance totally won me over in this, which doesn't always happen, but you guys, those beautifully complicated family dynamics slayed me. I love Abigail Johnson so much for her awesome sister bff-ery portrayal, especially (view spoiler)[having Dana being understandably upset when she's having turmoil with her LI, bff, and newly found brother & etc, but completely gutted when she and her sister aren't talking. Also, tl;dr review: This concept excited me so much and it was executed so well. The romance totally won me over in this, which doesn't always happen, but you guys, those beautifully complicated family dynamics slayed me. I love Abigail Johnson so much for her awesome sister bff-ery portrayal, especially (view spoiler)[having Dana being understandably upset when she's having turmoil with her LI, bff, and newly found brother & etc, but completely gutted when she and her sister aren't talking. Also, as upset as Dana was to discover her father's infidelity, she couldn't not see Brandon as this awesome, amazing discovery and wanting to know him, which is really mature and gorgeous. Yay for siblings. (hide spoiler)]. I literally cried at least twice reading this, which is a hard sell for me if it doesn't involve an animal's death. I was blessed to receive an arc of this book from Abigail, and let's just say it was amazing. The story centers around a girl named Dana and how she wants to please her dad. She does a DNA test for him, so that he can find his family. When the results come back, Dana, finds out her dad might have a father or son. She immediately thinks it's her grandfather so she contacts him. Finding out the person is actually 18, Dana's life starts to crumble before her. Her dad had an affair. Dana meets a guy I was blessed to receive an arc of this book from Abigail, and let's just say it was amazing. Dana meets a guy named Chase, Brandon's cousin, and the two hit it off tremendously. But when Dana and her secrets crumble, so does their relationship. Most of Dana's relationships do. This book was a wonderful heartbreaking story about family and love. I loved it so much and I recommend all of Abigail's books. This isn't my full review, but you can find the full one on my blog. 4.5 stars!! Part of me liked how the book ended, but at the same time I would've been okay with it going the way I thought it was heading. This book will rip your heart out and put it back together, but in that way where you can tell it's been broken. Seriously, just read this book! It's freaking great!!! I heard about this book from the chapter a day book mail, months ago. Dana thought getting a DNA test done for her dad, who grew up in foster homes, was a nice thing. Little did she know that a huge can of worms would be opened big time. From finding out who the 50 percent match was, talking to them..............keeping it from her family, what a ride this book was. We all want the fairy tale, find a missing family member, meet and hug and presto instant loving connec I heard about this book from the chapter a day book mail, months ago. We all want the fairy tale, find a missing family member, meet and hug and presto instant loving connection. Does this happen in the book? Not going to reveal it. Who is the mystery person? I did like the tight bond between Dana and her sister and parents, it was a strong point for the book. Loved the softball aspect too even though some of it was difficult for them. I really enjoyed the characters, each was true to themselves and it kept me guessing in a lot of places. Es un libro un poco cliché en cuanto a personajes. Trata una historia que no es para nada novedosa que es el descubrimiento de un familiar desconocido. Y aún encima, una protagonista poco atrevida y lenta. Es decir, la historia en sí es lenta, pero ella, como no se atreve a dar el paso lo es aún más. No me ha gustado demasiado. Ha estado entretenido sin más. "...That kind of love is more than a feeling or a word. That kind of love is an action, a promise, and it's not dependent on perfection or ideals. It's real and lasting and worth everything. It's worth fighting for. And we're fighters, yes?" This was not at all what I was expecting it was so much better. The plot was heavy but it was delivered in such a sweet and fun way while still ripping my heart out along the way. I hope there is a follow up book on these guys lives becuase I am so in for "...That kind of love is more than a feeling or a word. That kind of love is an action, a promise, and it's not dependent on perfection or ideals. It's real and lasting and worth everything. It's worth fighting for. And we're fighters, yes?" I saw this book on my daughter dresser and decided that I would give it a try because she loves to write and she has great taste in books as well. Man let me tell you that this book held my attention the whole time I was reading it. I related so much with it. After reading it I found out that it was a teen book but I didn't care because it was so good that I would have never known. Full review to come on my blog! A book with so much heart! THE FIRST TO KNOW is about family and secrets and betrayal and mostly about love. Beautifully told with an ending that gives you all the feels. This book was such a good read! The plot had twists and turns that I didn’t even see coming but I really loved it. I loved getting to know Dana and Chase and the rest of the characters. Abigail Johnson has secured her place on my list of top favorite contemporary authors with this book. It's everything you want in a good story. Heartfelt characters you can sink into and live their life as it unfolds on the page, handsome well-rounded guys that make your heart pound harder, realistic family drama that propels the story forward. I loved this book so much. Once again I am left utterly speechless by an Abigail Johnson novel. How does she do it!?!! Because The First To Know is the most incredible, agonising, rip-your-heart-out-and-then-sew-it-back-together, amazing book. ....I hope the publisher wasn't expecting a put-together, coherent review, because all they are going to get is swooning, sighs, exclamation marks and fan-girling. Because it really is just. that. good. When Dana decides to surprise her father with a birthday present to beat all birt Once again I am left utterly speechless by an Abigail Johnson novel. How does she do it!?!! Because The First To Know is the most incredible, agonising, rip-your-heart-out-and-then-sew-it-back-together, amazing book. ....I hope the publisher wasn't expecting a put-together, coherent review, because all they are going to get is swooning, sighs, exclamation marks and fan-girling. Because it really is just. that. good. This book wrecked me. It was unputdownable! Dana was put in an impossible situation and served as the primary punching bag for a lot of the fallout. This book is important to understand the "Jay-Zs & Beyonces" of the world. It's important because it counterbalances the harsh, black-and-white perspective of self-righteousness promoted on sites like Reddit. It's brave in its display of forgiveness. All the characters in this book have realistic flaws and make understandable mistakes: Dana, her This book wrecked me. It was unputdownable! Dana was put in an impossible situation and served as the primary punching bag for a lot of the fallout. This book is important to understand the "Jay-Zs & Beyonces" of the world. It's important because it counterbalances the harsh, black-and-white perspective of self-righteousness promoted on sites like Reddit. It's brave in its display of forgiveness. All the characters in this book have realistic flaws and make understandable mistakes: Dana, her father, her mother (although truly, I think she was too hard on herself for the past), Selena (although to be honest... she didn't forgive/forget very well), Brandon, Chase (although he was perfectly sweet), Nick, and Jessalyn come to mind right away. Chase is the kind of guy a girl like Dana needs. He's straightforward and clear with his intentions. He's immensely confident, yet so caring for the important people in his life. He suffered some collateral damage, and your heart can't help but feel for him. This is a guy that deserves the sky (the sun, moon, stars, and everything in between). And poor, poor Dana. Remember: don't kill the messenger. I can't imagine what it would be like to discover what she did. She handled it in a way that was careful and considerate of the people she loved, but it wasn't her burden to bear.